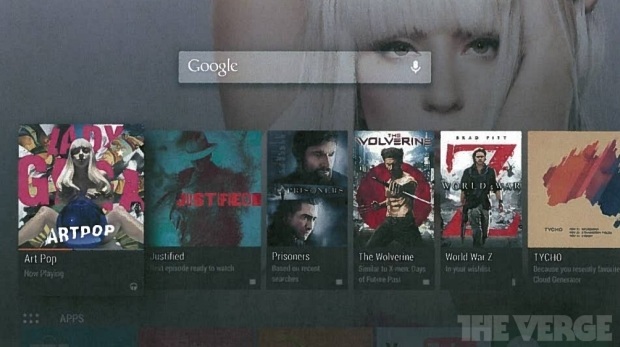 A detailed report published on a site about Google’s set-top box includes screenshots of Google’s Android TV user interface. The report that also cites Google documents says that the developers are already working on introducing apps for Android TV. Google was the only one who didn’t step into set-top box market. But with the latest news, it looks like Google has finally broken the barrier and is ready to launch its set-top box. This is not the first time that Google has come up with a device like that. Google introduced its first Google TV few years ago but it failed badly without getting much sales. According to several reviews and opinions, it was said that the poor sales of Google TV was due to its complicated user interface that was very difficult to navigate through. Both Google TV and Android TV are based on Android but Android TV provides much simple and easy to use interface. The functions are displayed as cards like movies, shows, games and apps. To navigate through them, there is a D-pad that comes with the device. The remote also includes Enter, Home and Back buttons beside the D-pad. So far, there is no word from Google whether the news is true or not but whatever the case is, we are pretty sure that the report and its content are all real and Google is planning on unveiling Android TV anytime soon. If we are to guess an occasion for the launch of Android TV, we would say that it could happen at Google I/O developer conference this year. Let’s wait and see when Google will officially set the dates for Android TV.